This chapter presents the minimum jerk trajectory planner which is developed to generate smooth trajectories for the 5-DOF upper limb exoskeleton. The minimum jerk criterion is derived from observing normal human motion and is therefore very suitable for formulating the trajectories of a rehabilitation exoskeleton. The minimum jerk criterion is first introduced using a simple point-to-point trajectory for the 1-DOF elbow joint. For the multi-DOF shoulder joint, the minimum jerk trajectory of the shoulder movement is determined and then converted to their respective exoskeleton joint trajectories. 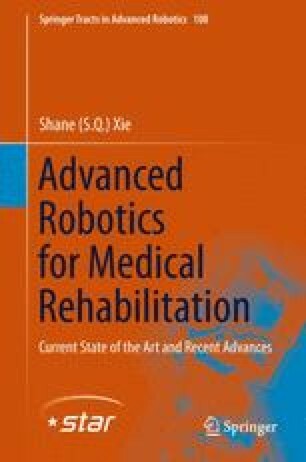 This chapter presents force-based control strategies that allow the exoskeleton to interact with and respond to the unpredictable behaviour of the user’s limb. The concept of admittance and impedance interaction method is discussed and applied to the upper limb and exoskeleton system.